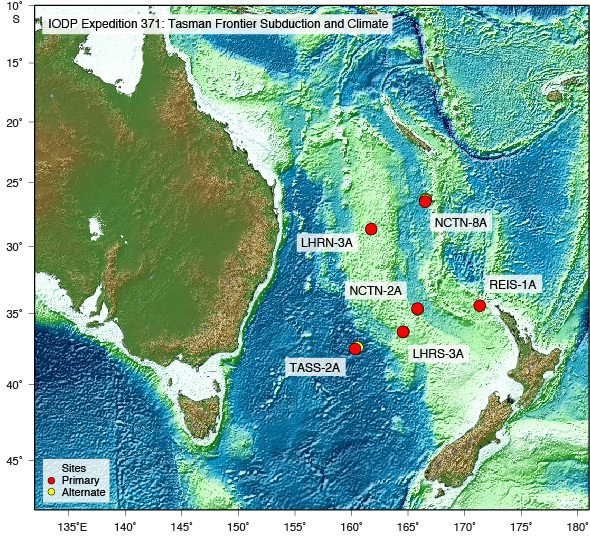 The Tasman Frontier expedition (based on IODP Proposals 832 Full2 and 832 Add) will investigate the Eocene Tonga-Kermadec (TK) subduction initiation (SI) and evaluate whether a period of high-amplitude long-wavelength compression led to initiation of TK subduction or determine if alternative geodynamic models were involved. Core and log data from boreholes in the Norfolk Ridge, New Caledonia Trough, Lord Howe Rise and Tasman abyssal plain will provide constraints on seismic stratigraphic interpretations and the timing and length scale of deformation and uplift associated with the largest known global SI event and change in plate motion. The Paleogene and Neogene sediments will also constrain paleoceanographic changes caused by SI as well as tropical and polar climatic teleconnections and the transition from greenhouse to icehouse climate states in a region with large meridional variations in surface water properties in a strategic “Southern Ocean Gateway” setting. To participate in the webinar, you will need access to the internet with a computer equipped with a microphone and speaker. To register, please visit https://attendee.gotowebinar.com/register/5631935328324431620. We are drilling at the second site in the New Caledonia Trough. We have our first birthday celebration event today. It’s Kristina’s birthday. I work with her in the paleontology lab, and she is a radiolarian specialist. We all signed on a birthday card to send our blessings to her. The galley group made a nice cake, and we had a small party with pizzas. Although only half of the group (the nightshift group) is there, it was a warm celebration and a very nice break between work. There were two rounds of zoom sessions for the education/outreach. Deb is the education officer, and she is also my roommate. The first session was at 3 am, and the second session was at 10 am. 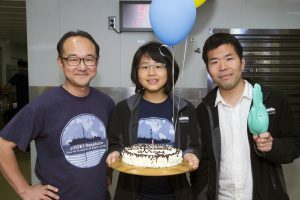 Because I work in the night shift, from midnight to noon, I could join both sessions, and talk to the students on shore. The students in the first session are college students in LA, California. I introduced some microfossils, such as forams and ostracods, and showed the images of some fossils that we just collected at the second site to them. The students in the second session are high school students in Brisbane, Australia. Jerry, the co-chief, hosted the session, and he introduced nicely about the paleontology lab. This real-time science education program is not limited to certain areas or audience, so anyone can sign up! 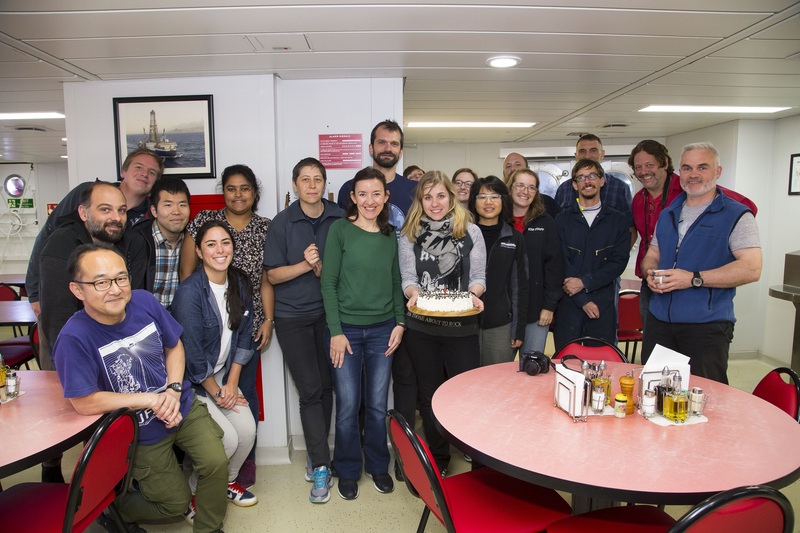 If you’re interested in showing the IODP shipboard science work to your students, just contact the IODP E&O office!